Today Kerry Hammond reviews Sophie Hannah's latest psychological thriller. 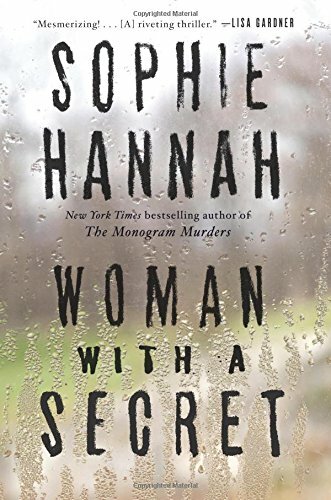 Woman with a Secret by Sophie Hannah is on bookshelves in hardcover on August 4, 2015, published by William Morrow. Sophie has been in the spotlight most recently for her book The Monogram Murders, which featured Agatha Christie’s famous sleuth Hercule Poirot. It was the first time Poirot has been a character in something that wasn’t written by Christie and the book was met with positive reviews, including my own. I enjoyed The Monogram Murders and thought Hannah did a great job of continuing such a famous series. Hercule Poirot was the reason I discovered Sophie Hannah and after finishing, I knew that I had to read other books by this author. She’s written nine standalone novels, and Woman With a Secret is her latest. The main character, Nicki Clements, has a secret. She corresponds via email with a man who she has never met. She shares things with him she has never shared with anyone else, including her own husband, and her husband is unaware that Nicki has this internet relationship. Nicki is walking a thin line of deception that she feels she’s kept under control. That is, until one day she is seen passing the scene of a murder and the police wonder what she was doing there. Circumstances that are initially unknown to the reader lead Nicki to lie to the police about her presence at the scene, and she goes to great lengths to cover up her lie. Unfortunately for her, the police investigate and discover her deception. What they uncover leads them to believe she is guilty of the murder, and her carefully constructed web of lies begins to unravel. What we find out goes way deeper than an anonymous internet affair. Everyone has secrets, even if they’re benign or insignificant. So we can all relate to the concept of wanting to keep our secrets to ourselves. We live in the age of the Internet and anonymous emails, and this makes it simultaneously easier to have secrets, and harder to keep them. Easier because you can create an anonymous email and send messages to anyone. Harder because of the trail you leave behind when you enter cyberspace. Nicki Clements’ secret started off as something she felt could harm no one, and it snowballed into a situation that she found it difficult to control or step away from. This was one of those books that leaves you thinking, this could really happen. Which then makes you wonder, what you would do in a similar situation? I loved watching the events unfold and the characters decide how to handle the dilemma they’d found themselves apart of. The author slowly and suspensefully feeds the reader the facts and I found myself mesmerized. The opening pages of the book contain an anonymous email that lays out the entire murder, including the message written on the wall, “HE IS NO LESS DEAD.” I found myself immediately hooked and needing to find out what this meant. Hannah is an excellent storyteller and I am can't wait to check out her other books.